Peanuts were in the news this morning*. This interested me, as I recently met peanuts in their growing state for the first time. The situation was an urban garden within spitting distance of downtown Indianapolis, which I’ll write about later. Of course most people know that peanuts are not nuts, but legumes, making them cousins of peas and beans. 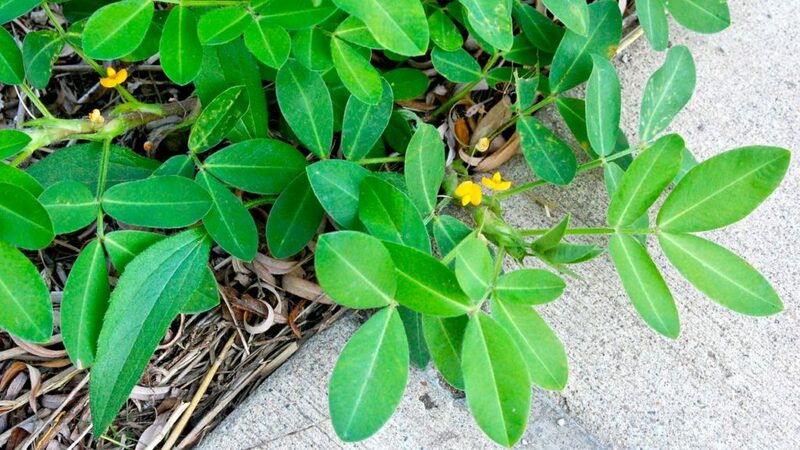 The first photo shows the characteristic pea-like compound leaf and flower with its wings and keel. What’s neat about peanuts is how the nuts or seeds develop. 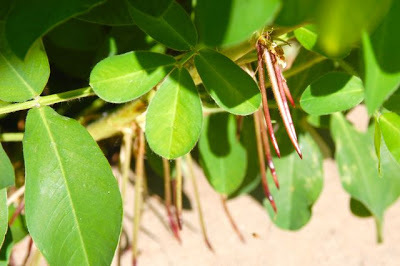 Once fertilized, the flowering stem sends out what look like aerial roots, known as pegs, but which are really part of the reproductive system. In the second photo, you can see the pointy tips that grow into the soil where the peanut pod will form beneath the surface. This is why peanuts are also called ground nuts. While I did know about peanuts’ subterranean habits, I’d always figured the nuts formed on the plant roots, rather like potatoes. I will now give peanuts much greater respect for procreative ingenuity. Did you know that peanuts are grown commercially in Ontario? Those former tobacco fields in Southwestern Ontario offer just the right conditions – sandy soil, and warm enough, long enough, for early-bearing varieties to mature. This link from the Ontario Ministry of Agriculture, Food and Rural Affairs (OMAFRA, to those in the know) tells you more about peanuts and about production in the province. Two Ontario growers that I know of produce and market their own peanuts: Kernal Peanuts and Picard’s Peanuts. [*Today’s news about peanuts is that 2011’s crazy weather has caused major crop losses in the southern States. The price of peanut butter could rise as much as 30%. Hard news for my family, as peanut butter is a staple in our diet. Although peanut allergies make it a very different world for a growing number of kids today, I think I ate peanut butter sandwiches every day of my public aka elementary school career. This is awesome news. Here I thought peanut country was only in Georgia, US. I live jsut across the border with similar growing conditions. Hi, Rhonda, Only certain varieties such as Valencias are suitable for northern growers. Although written for larger-scale producers, the OMAFRA link will tell you more. I too had assumed peanuts grew among the roots right from conception, as it were. This is fascinating. Are there any other plants that grow in this way? I'm amazed we don't all know this from age three. It's so surprising you'd think it would come up in every general knowledge quiz! Great question, Esther. 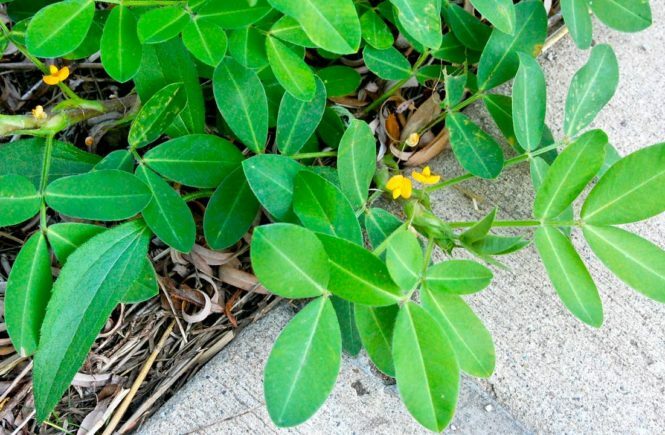 Just Googled it myself, and Wikipedia lists a few other species of ground nut in the legume family, similar in growth habit to the everyday peanut. It is a strange and ingenious adaptation to harsh climate and probably to predation. It's fun to grow different kinds of vegetables and watch their growing habit. My dad used to plant plenty of peanuts in our backyard.